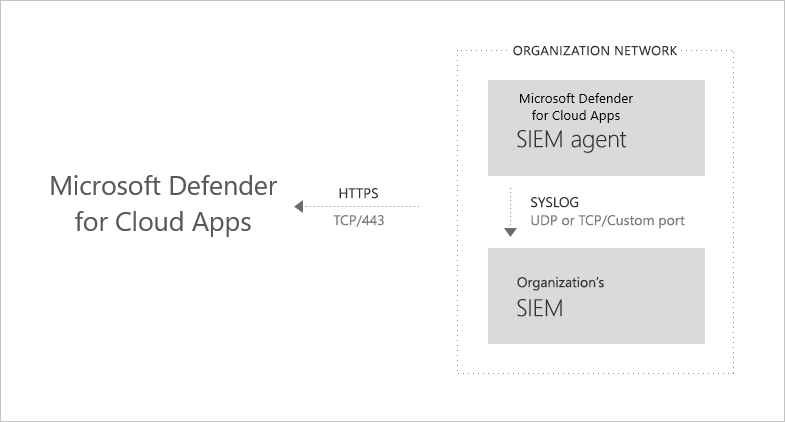 You can integrate Microsoft Cloud App Security with your SIEM server to enable centralized monitoring of alerts and activities from connected apps. As new activities and events are supported by connected apps, visibility into them is then rolled out into Microsoft Cloud App Security. Integrating with a SIEM service allows you to better protect your cloud applications while maintaining your usual security workflow, automating security procedures, and correlating between cloud-based and on-premises events. The Microsoft Cloud App Security SIEM agent runs on your server and pulls alerts and activities from Microsoft Cloud App Security and streams them into the SIEM server. When you first integrate your SIEM with Cloud App Security, activities and alerts from the last two days will be forwarded to the SIEM and all activities and alerts (based on the filter you select) from then on. If you disable this feature for an extended period, then re-enable, the past two days of alerts and activities are forwarded and then all alerts and activities from then on. The SIEM agent is deployed in your organization’s network. When deployed and configured, it pulls the data types that were configured (alerts and activities) using Cloud App Security RESTful APIs. The traffic is then sent over an encrypted HTTPS channel on port 443. 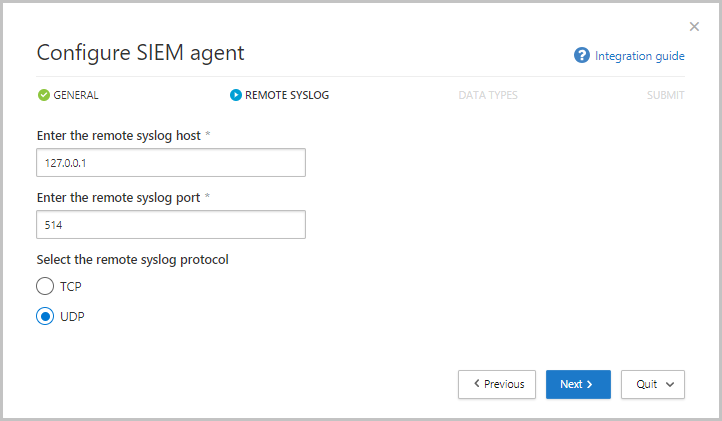 Once the SIEM agent retrieves the data from Cloud App Security, it sends the Syslog messages to your local SIEM. Cloud App security uses the network configurations you provided during the setup (TCP or UDP with a custom port). Cloud App Security currently supports Micro Focus ArcSight and generic CEF. Set it up in the Cloud App Security portal. Download the JAR file and run it on your server. Validate that the SIEM agent is working. A standard Windows or Linux server (can be a virtual machine). The server must be running Java 8; earlier versions aren't supported. The server must be running Java 8. Earlier versions aren't supported. In the Cloud App Security portal, under the Settings cog, click Security extensions, and then click on the SIEM agents tab. Click the plus icon to start the Add SIEM agent wizard. In the wizard, click Start Wizard. In the wizard, fill in a name, and Select your SIEM format and set any Advanced settings that are relevant to that format. Click Next. Type in the IP address or hostname of the Remote syslog host and the Syslog port number. Select TCP or UDP as the Remote Syslog protocol. You can work with your security admin to get these details if you don't have them. Click Next. Select which data types you want to export to your SIEM server for Alerts and Activities. Use the slider to enable and disable them, by default, everything is selected. You can use the Apply to drop-down to set filters to send only specific alerts and activities to your SIEM server. Click Edit and preview results to check that the filter works as expected. Click Next. Copy the token and save it for later. Click Finish and leave the Wizard. Go back to the SIEM page to see the SIEM agent you added in the table. It will show that it's Created until it’s connected later. Any token you create is bound to the admin who created it. This means that if the admin user is removed from Cloud App security, the token will no longer be valid. In the Microsoft Download Center, after accepting the software license terms, download the .zip file and unzip it. The file name may differ depending on the version of the SIEM agent. Parameters in brackets [ ] are optional, and should be used only if relevant. It is recommended to run the JAR during server startup. Windows: Run as a scheduled task and make sure that you configure the task to Run whether the user is logged on or not and that you uncheck the Stop the task if it runs logner than checkbox. DIRNAME is the path to the directory you want to use for local agent debug logs. ADDRESS[:PORT] is the proxy server address and port that the server uses to connect to the Internet. TOKEN is the SIEM agent token you copied in the previous step. You can type -h at any time to get help. Activities/Alerts destinationServiceName Activity or alert originating app, for example, Office 365, Sharepoint, Box. Activities/Alerts csLabel Each label has a different meaning, but the label itself explains it, for example, targetObjects. Activities/Alerts cs The information corresponding to the label (the target user of the activity or alert as per the label example). 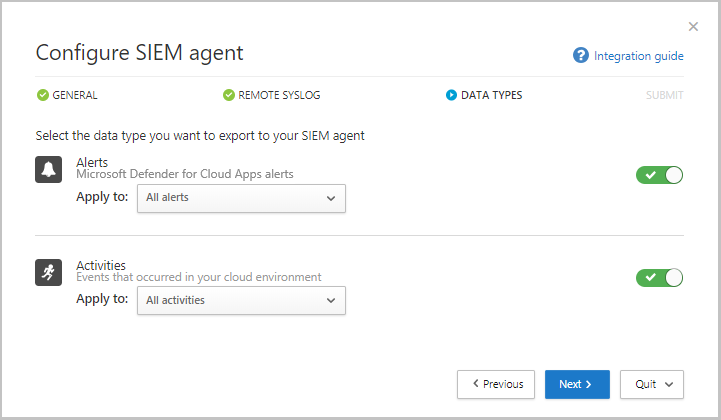 Make sure the status of the SIEM agent in the Cloud App Security portal isn't Connection error or Disconnected and there are no agent notifications. It will show up as Connection error if the connection is down for more than two hours. The status shows as Disconnected if the connection is down for over 12 hours. In your Syslog/SIEM server, make sure you see activities and alerts arriving from Cloud App Security. If you lose the token, you can always regenerate it by clicking the three dots at the end of the row for the SIEM agent in the table. Select Regenerate token to get a new token. To edit the SIEM agent, click on the three dots at the end of the row for the SIEM agent in the table, and select Edit. If you edit the SIEM agent, you don't need to rerun the .jar file, it updates automatically. 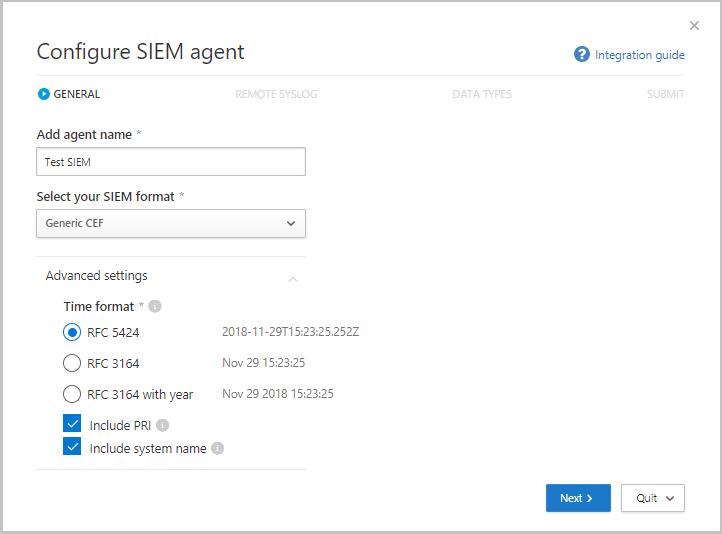 To delete the SIEM agent, click on the three dots at the end of the row for the SIEM agent in the table, and select Delete.